NYC, 02/14/2019, 2:00PM. 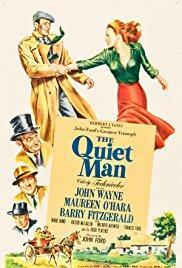 Two Time Oscar Winning The Quiet Man (1952): Boxer Finds Love. 129 min. Director: John Ford. Starring John Wayne, Maureen O'Hara, Barry Fitzgerald. The Quiet Man won the Academy Award for Best Director for John Ford, his fourth, and for Best Cinematography. In 2013, the film was selected for preservation in the United States National Film Registry by the Library of Congress as being "culturally, historically, or aesthetically significant.